Thai food is my all time favourite. 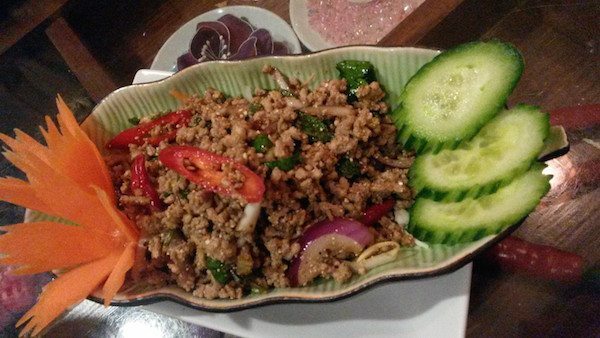 Before I ever travelled to Thailand, and I’ve been back several times since my first ever visit, I loved a Thai meal. Since then my passionate love affair with the fresh, spicy and fragrant cuisine has blossomed and grown into a bit of an addiction. In Thailand food is a very important part of life, language and society; families coming together with a dish each, spreading it over a mat on the floor and getting stuck in with the use of a spoon, a hand or a leaf of savoy cabbage used as a makeshift spoon. 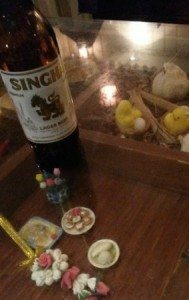 The stable that holds it all together is rice, known as khao, and the Thai words I learnt for ‘eat’ is actually ‘eat rice’ or gin khao – breakfast is gin khao chao (eat rice lunch). I say ‘the Thai words I learnt’ because the bits of Thai I learnt to speak on my first visit to Thailand actually turned out to be very common street Thai – the type of language to be heard or spoken by a very low class of people. Also, after spending a few months working with these people and their elephants, seeing how they would give their last bag of rice to a stranger, share a bottle of beer between 5 people to make sure everyone got some, and even going out unprompted to buy me a toilet roll in case I wanted to spend a penny during the course of the evening instead of using the hand dug squat toilet/latrine with a bucket of water at the side, I was proud to be speaking ‘low class’ Thai. What I’d seen of the higher class Thai people, refusing my new friends and teachers entry to a bar, based on their clothes and their being recognisable as mahouts (people who ride elephants), really rather disgusted and embarrassed me. They were the warmest and most generous and genuine people I’d ever met. They taught me humility and the value of actions speaking louder than words. My words were few and my actions many, trying to show my willingness to get involved and get my hands dirty. In exchange for my efforts I was invited to share their delicious and humble meals, was taught a few recipes (getting my hands slapped when I did it wrong!) and laughed a lot. One of my favourite Thai dishes is laab. It’s minced pork with red hot chillies, toasted rice, shallots and mint with lime juice, eaten with savoy cabbage to cool your mouth down. Traditionally it’s eaten cold, a fresh and spicy salad, and it’s absolutely amazing. I’ve struggled for years to find anything in Brighton to compare to what I’d eaten on my travels around Thailand, but then I did. 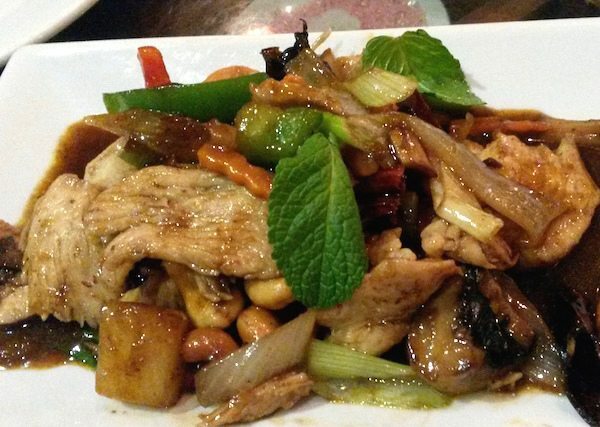 This brings me – about time you say – to Muang Thai, up the top of St James’ Street. A small and bright little restaurant, delivering all over the city, and eating in is an authentic and charming experience. All the regulation carved wood décor is there, along with a soundtrack of Thai love songs and some really good food. I think they could have changed management over the years, most of the waiters now being serious and Vietnamese rather than what used to be a very friendly family from Chaing Mai, but it doesn’t detract from the quality of the food or the value for money. The restaurant is immaculate in it’s simplicity and the atmosphere is welcoming. Their laab muu is one of the best I’ve had outside of Thailand, served on the cabbage leaf, dripping in lime juice and fish sauce – the flavours of Thailand. It’s delicious, and when I went with my mum last week, it was the first thing I ordered without question. It was crisp, sweet, salty, REALLY spicy crunchy and tangy – all the things you need for a good laab. You have to try it. We also ordered the regulation Chicken Satay for starter – mum’s favourite. It arrived charred and brown on the skewer, the sauce sticky, thick and and chunky, really good. Our third starter (!) 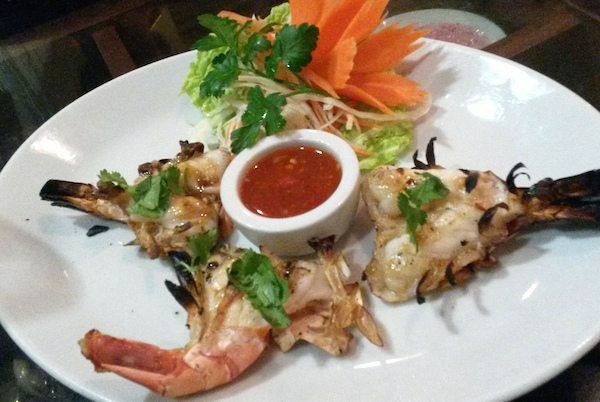 wasn’t really a starter but we both really fancied a grilled prawn. It was Grilled King Prawns with Dry Chilli and Garlic. The prawns were big, butterflied and charred from the grill. They were succulent and juicy, tasty and very simply dressed with a drizzle of savoury garlic and chilli dressing. I love getting stuck into peeling big prawns, the satisfaction of eating them after taking the time to peel them when they are steaming hot, is all part of the experience. We had a little rest after our starters to admire the brilliant tables, which were glass topped works of art, under which lay little sections with some strategically placed chillies or lemongrass stalks – in mine was a little scene of Easter chicks next to a garlic bulb, and some teeny tiny flowers made of a combination of plastic and sugar. You don’t get that in Pizza Express do you. and peanut sauce is rich and sweetly spicy, only mild with chillies but full of flavour. In Muang Thai’s case, they used cashews instead of peanuts, but this did nothing but add to the delight for me. The potatoes were firm but cooked nicely, holding their shape, and the beef was tender and soft. It was a really large portion (ha!) and I’d definitely recommend it. I’ve had Massaman’s (Massamen?) before that were too thick or too watery, with tough old beef or too many potatoes – this was pretty near perfect. The stir fry was Chicken with Cashew nuts and dried chilli (we didn’t expect two cashew dishes but we didn’t mind at all!). It was gorgeous – the balance of flavours amazing, really fresh tasting and yet dark and savoury. The mushrooms were big and juicy, mint leaves wrapping their flavour like sharp little accents amongst the deep dark oyster sauce and insanely spicy dried chilli. The crunch came with peppers, carrots and onion and the chicked was cooked to perfection. 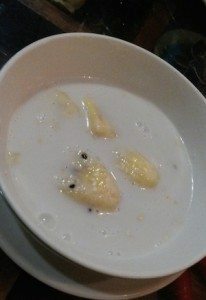 We rounded off the night with another Singha beer (me) and a nice coffee (mum) and shared a Banana poached in sweetened coconut milk and sprinkled with sesame seeds. It was warm and comforting and sweet and sumptuous. Yum bloody yum. 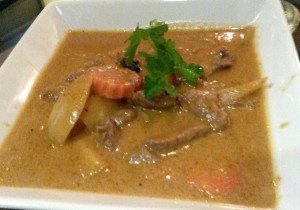 If you like me, like Thai food, and you’ve done the rounds with Green Mango, Giggling Squid and the like – all great restaurants but I find a bit sterile and British, try a bit of Thai charm at Muang Thai.